Does the purchase of a Prius come with a side of moral superiority? With the newest iteration of the Toyota Prius having recently debuted at the Detroit Auto Show, it is about time to stop and take a look at all the hype surrounding this relatively unexciting, yet alarmingly popular, hybrid. The Prius is a “fullâ€ hybrid – one that can run on purely electric power up to a certain speed without needing the gas engine’s assistance – and because of this, it gets a fantastic 48 mpg around town and has lower emissions than most vehicles on the road. As a four-door family car, it performs the basic functions of getting from A to B just as well as any new car with four wheels and five seats. And as a Toyota, the branding symbolizes security and reliability for many Americans. These are all appealing points, indeed – but enough to win the hearts of over one million buyers around the world? Apparently so. The Prius’ success is tremendous, despite the unfortunate body styling (a trait that has been moderately rectified in the redesign), an awkward, uninspired drive quality and high price tag. In fact, there appears to be no reason why it should be doing any better than the Honda Civic Hybrid. Honda released a hybrid version of their popular sedan (number one best selling car in America during the gas crunch last summer) just a year after Toyota’s hybrid debut to compete against the Prius. Despite their similarity in gas mileage and emissions, reputable brand name and less than a $1,500 difference in MSRP, the Toyota outsells the Honda 5 to 1. As usual, it all comes down to looks. The pod-like design was so out there and unlike anything on the market when it was first released that journalists exclaimed, “this will never sell!â€ at the media launch and scoffed that the American public wouldn’t take to the outrageous design. With its extreme design that effortlessly captures attention, the Prius made eco-friendliness acceptable and, dare we say it, cool. Trendsetting celebrities came first; the ever-cool Leonardo DiCaprio bought one in 2001, and gorgeous Cameron Diaz was right behind him. Then all sorts of rich and famous types were showing up in them, limo-style, to premiers and eventually putting money down for one. As is the nature of trends, the public soon took to the Prius like dog hair to clothing. It was suddenly everywhere! Sales figures doubled two years straight and continue to remain high. But instead of disappearing into oblivion like trapper keepers and pet rocks before it, the Prius hasn’t stopped dancing yet. This car became a symbol for the massive green revolution currently dominating our country. This was all puppies and kittens until a less warm and fuzzy trend began to dominate: the emergence of the über Prius snob. See, Prius owners seem to be painfully aware their car is the ultimate green machine. They take the gas mileage numbers and shove them down friends and neighbors throats while sticking their noses up at gas-guzzling SUVs. Or, at least that’s how it seems to outsiders. Don’t even mention battery toxicity to a Prius driver, or the fact that their cars are wastefully shipped in from around the world – Toyota has just halted plans to build a Prius plant in the States. They won’t hear a word. 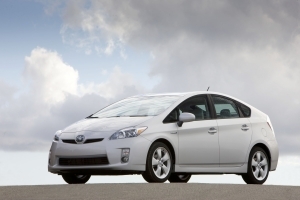 Instead, listen to the Consumer Reports survey that concluded 94 percent of Prius owners would buy another Prius. As Jay Leno recently said on Top Gear, a British car program, “Americans want everyone to know about the charity they do anonymously.â€ That’s what the Prius is: a purchase to secure an individual’s moral superiority. Prius owners wave to each other from inside their pods and speak ad infinitum about the car’s mpgs. There are entire websites devoted to the coolness that is the Prius. These owners have become smug. I once saw a Prius with a license plate that read “Piusâ€. It would be funny if it weren’t just so darn sad – and spelled about as correctly as Flickr. Here’s the rub: does it even matter? Whatever the motives of hybrid owners – Prius or other brand – shouldn’t we just be happy about their choice? With over a million of Toyota’s machines having been sold, and countless others from the world’s manufacturers being driven off lots, maybe it’s time to ignore the snobbery. Purchasing a hybrid does help the environment on some level – not as much as some would like to believe – because seeing the Prius everywhere does reaffirm the excessive, but necessary, attention we’ve been giving to green issues. With the upcoming appearance of the Honda Insight, due out this spring, the Prius will even have some direct (and cheaper) competition. Will Insight owners join the upturned nose brigade? Let’s hope the competition just makes for a more interesting marketplace, and takes Prius owners down a notch. Maybe I should stop grumbling about swollen egos and haughty attitudes and smell the lack of fumes. You can’t fight the future. Soon we’ll have less toxic batteries and an American hybrid or American plant to reduce resource-wasting imports (fingers crossed!). That’s worth putting up with “Piusâ€ owners for a little longer.